Over the past week, numerous teams wrapped up their regular seasons and have turned their attention to the postseason - either league tournaments or getting ready for the state ones. Other sports, such as football, are still in the middle of trying to secure a playoff spot. Of course, every team has a player they can depend on during these crucial points in the year. Southington’s Lynsey Danko and Plainville’s Frank Griffin were just that this past week with both playing pivotal roles in helping their respective teams come out with wins. Danko has been instrumental to Southington volleyball team’s success this season. The Blue Knights are currently the No. 2 ranked team in the state and are the top seed in the Class LL rankings with an 18-0 record. Over the last week, Southington beat three teams, Conard (3-1), NFA (3-0) and Northwest Catholic (3-0) to cap off its regular season. The senior libero started the week on a high note, notching 34 digs and five aces against the Chieftains on Monday. The following night, Tuesday, was senior night and the Blue Knights knew they wanted nothing but another win. Southington was also able to work through a little lineup adjustment and trouble in the beginning. Danko recorded three aces, eight digs and one kill Tuesday evening, not to mention she made an impressive save, as the ball ricocheted off the ceiling. “That play she made off of the ceiling, that itself gives your team a lot of momentum and takes a lot of momentum away from the other team,” Hietz said. This season alone, Danko has made eight kills, 47 aces and 304 digs. This week Southington entered the CCC Tournament, which began on Monday. The Blue Knights will begin the state tournament Monday, Nov. 5th. The Plainville football team is currently 4-3 on the season with its most recent 49-15 win over East Catholic on Friday. During the game, Griffin, the team’s senior quarterback, threw for 99 yards and a touchdown, followed by another 323 yards on the ground and five touchdowns, breaking the Plainville school record of most rushed yards in a single game. Griffin said breaking the single game rushing record was a very memorable moment for him, but it was never in his plans to do so. Through five games this season he’s rushed 503 yards with 11 touchdowns and in the air Griffin has connected on 56 of his 90 attempts for 726 yards and three more scores. Of course, for all the personal records Griffin has or will set, the team’s success is always what will be the most important aspect of the game to him. 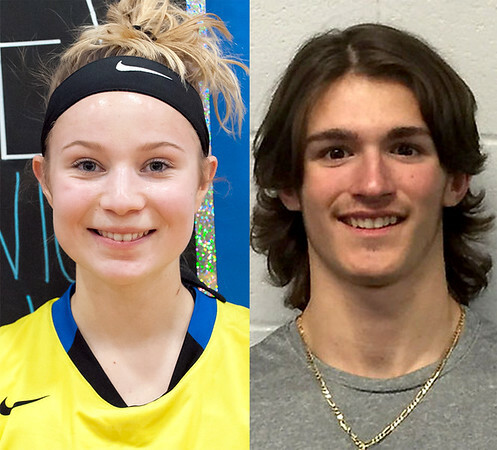 Posted in New Britain Herald, Athletes of the Week, Plainville, Southington on Monday, 29 October 2018 20:39. Updated: Monday, 29 October 2018 20:42.